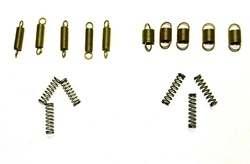 We are a leading Manufacturer & Exporter of Reversing Switch Springs. Our product range also comprises of Compression Springs, Torsion Springs and Conical Spring. We are instrumental in offering a genuine quality range of Reversing Switch Springs to the customers. These springs are made by employing latest technology and advanced machinery, at the state-of-the-art infrastructure. Moreover, customized springs can be availed from us that are designed as per the exact details provided by the clients.